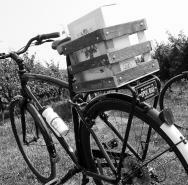 Offers bicycle rentals and tours for touring beautiful Essex County. Find your own pace on sunny bike-friendly terrain, or join a weekend tour of fabulous award-winning wineries and friendly farms and attractions. Take our 1 O'Clock Tour where we'll visit three wineries for tastings or contact us for a custom tour! Rentals are available on a drop-in basis 7 days a week between Canada Day (July 1st) and Labour Day (first monday in September) or anytime by reservation.